The Australian though was made to fight every inch of the way by a stubborn Williams who had chances to win himself. For two players, noted for brilliant attacking play the first frame resembled a chess match as both players fought out a tactical battle that went right down to the colours. And it was Williams who made a critical arror when a poor safety shot on the last red left Robertson with a chance. Trailing by 34 points Robertson needed everything to pinch the frame, and with nothing less than great care and attention he knocked in a 35 to steal the frame by one point and lead 1-0. That frame had taken 40minutes to be resolved. The second, was somewhat different as Williams took six minutes to wrap it up with the help of a 78. Williams looked certain to take the third frame but it was wrenched away from his grasp after a kick on the final yellow. Suffering the kick was bad enough but then the Welshman could only sit and watch as Robertson clipped in the yellow and cleared up with 27 to move 2-1 in front. 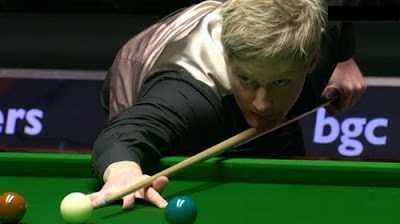 As if that wasn't bad enough for Mark the Australian soon rubbed further salt into Williams's wounds when he drilled in a break of 95 to lead 3-1. Runs of 23 and 38 accounted for the fifth frame to build up a three frame advantage over his fellow left hander. Williams badly needed the sixth if he was going to stay in contention and took it. It proved a catalyst for the Welshman who stepped in with a timely 68 to further reduce his deficit to just 3-4 after Robertson missed at close range red and left it sitting over the pocket. It looked as if Mark was heading for a hat trick of winning frames when he was first in with a 20 in frame nine. 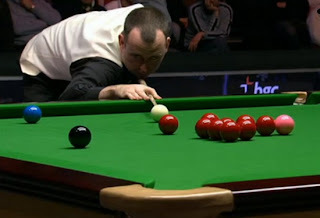 But an overcut red to the corner was to put an end to his hopes at levelling at 4-4 as Robertson tapped in the close range red and made a clearance of 119 to move to within one frame of the last four. Williams though was in no mood to surrender and when Robertson missed from close range with the rest he was waiting to pouce. He knocked in a quickfire 78 to remind Neil that any mistakes would be punished an closed to 4-5. But all of that hard work was undone in the following frame with missed black. It was to prove to be Mark's last shot in the Masters this year as Robertson rattled in a 57 to seal a 6-4 victory and set a semi final with Judd Trump.